Red clover is a legume that is well adapted to poorly drained soils and more tolerant of lower soil pH and fertility than alfalfa. The yield potential of red clover is excellent and red clover varieties can have higher forage yields than alfalfa. Red clover is considered a short-lived legume, but new modern varieties are productive for three full seasons after establishment. 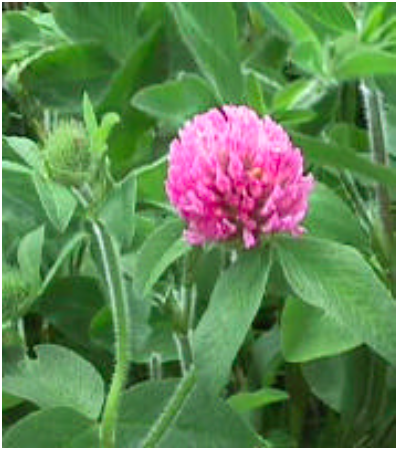 Red clover is most commonly grown for silage or pasture in Wisconsin. It is not commonly harvested and stored as dry-baled hay due to its slow drying rate. A number of research studies evaluating utilization of red clover by lactating dairy cows have recently been conducted at the University of Wisconsin, and the USDA-ARS, US Dairy Forage Research Center (DFRC). This Focus on Forage highlights findings of these research efforts. From a nutritional standpoint, red clover and alfalfa are different types of forages that should not be considered equal. In a general sense the nutrient contents of alfalfa and red clover such as crude protein (CP; 16-22%), acid detergent fiber (ADF; 25-35%), neutral detergent fiber (NDF; 35- 45%) and mineral concentrations are similar. However, a number of major nutritional differences exist between red clover and alfalfa. One of the big differences is that red clover contains polyphenol oxidases. These are enzymes that play a role in inhibiting plant proteases (protein degrading enzymes) and proteolysis (protein breakdown) in the silo. As a result of the action of polyphenol oxidases, red clover protein is not broken down during silage fermentation to the extent of alfalfa protein. Therefore, red clover has more undegradable protein (bypass protein = 25-35%) than alfalfa (15-25%). In addition research has shown that when red clover and alfalfa are of similar fiber content red clover may be more digestible than alfalfa providing a more energy dense forage to the diets of lactating dairy cows. Although lactation performance has varied among trials, the analysis of seven experiments conducted at the University of Wisconsin and the US Dairy Forage Research Center comparing red clover with alfalfa shows that red clover inclusion in the diet reduced dry matter intake, and has a slight suppressing effect on milk production. In some studies milk protein percentage was reduced when red clover replaced alfalfa in the diets of lactating dairy cows. However, when all trials were considered together there was no net effect on milk protein and fat percentages. In other experiments dry matter intake and milk production of lactating dairy cows was improved by replacing red clover with normal or brown midrib corn silage in the diet. The magnitude of milk yield reduction in cows fed red clover as compared to other forages has been relatively small (1.0-3.0 lb/cow/day), and in some cases feed efficiency was improved. A common observation in all lactating dairy cow experiments conducted in Wisconsin has been a reduction in feed intake when red clover was fed. The reasons for feed intake reductions in cows fed red clover based diets have not been determined. No studies have been conducted to determine the effect of feeding red clover to transition and very early lactation cows (< 60 days in milk) where the effects of reduced feed intake may be more severe. Is red clover an inferior forage for lactating dairy cows? No. In experiments red clover has supported very good levels of milk production, but research indicates that different diet formulation strategies may be needed when red clover forages are fed. For example, red clover has more bypass protein than alfalfa but in an experiment cows fed red clover and supplemented with a bypass protein supplement (fish meal) still had improved milk yields. In another experiment, cows fed red clover based diets containing 20.0% crude protein produced more milk than cows fed red clover based diets containing 17.5% protein. So, despite laboratory evidence suggesting red clover may be a better protein source than alfalfa, cows fed red clover seem to respond with improved milk production to additional protein supplementation. In other experiments, feeding combinations of red clover/corn silage or red clover/brown midrib corn silage resulted in improvements in feed intake and milk production indicating that red clover/corn silage mixtures are well suited in a forage program for lactating dairy cows. In another study, feeding a combination of red clover and alfalfa that were grown and ensiled together reduced non-protein nitrogen in the silage and had positive effects on feed intake and milk production. Do cows really have black loose manure when fed red clover? Yes. In the past, this effect was considered to be of no important biological significance. While the reasons for black loose feces in cows fed red clover is still unknown the effect is now at least considered in the scheme of red clover utilization. For example, the effect may be related to feed intake suppression. However, a mechanism that explains the black feces and laxative effect in cows fed red clover is unavailable. Understanding that red clover is different than alfalfa is important when formulating diets for lactating dairy cows. Most importantly it should be remembered that feeding cows red clover based diets might limit feed intake as compared to alfalfa of similar quality. Below is a list of important diet formulation concepts to consider when feeding red clover forages. Harvest and feed red clover of very high quality. Harvest recommendations are similar to alfalfa. The best forage quality and milk yield potential occurs when red clover is harvested at the late bud or early bloom stages of maturity. Delayed harvest of red clover, while showing only minor declines in laboratory assessed forage quality, has resulted in dramatic declines in milk production. Delaying harvest of the first cutting red clover can also result in severe lodging and potential rapid decline in forage quality and milk yield potential. To enhance feed intake blend red clover with another forage such as alfalfa, conventional corn silage, or brown midrib corn silage. Conduct complete laboratory analyses to evaluate red clover prior to feeding. Use wet chemistry laboratory methods to evaluate red clover for ADF, NDF, NDF digestibility, and protein solubility. In addition, the bypass protein content of red clover should be analyzed using NIRS techniques. Use supplemental protein to maintain good milk yield when using red clover forages. Red clover can be high in energy (TDN, NEL), but feed intake may be limited. Therefore, for early lactation high producing dairy cows it is advisable to maximize dietary energy using strategies such as fat supplementation or high energy grains. While recent investigations have found differences between red clover and alfalfa utilization in lactating dairy cows it should be remembered that differences mainly apply to the nutrition programs for early to mid lactation dairy cows. Red clover has been and is an excellent feed for many classes of livestock including dry dairy cows, dairy heifers, dairy beef, or beef cows. space Space Late Summer Planting Legumes to Produce Nitrogen Credits for Next Year by Dan Undersander, Department of Agronomy Carrie Laboski, Department of Soil Science The high price of nitrogen fertilizer has increased interest in planting a legume crop after wheat or canning crop harvest as a green manure to provide some nitrogen credits for next year’s crop. This practice can provide some nitrogen and organic matter as well as increase ground cover to reduce erosion from fields.